exploring it by night is a whole new world. As the sun goes down, the underwater world changes, as day creatures retire and nocturnal organisms emerge. Learn Watch the new world come to life in magnificent colours, under the glow of your dive light. So if you’ve ever wondered what happens underwater after the sun goes down, sign up for the PADI Night Diver Specialty course. This course counts as one of the five Specialty courses towards your PADI Master Scuba Diver certification. Duration: Training dives: 3 (2) - Nights: 2. Scuba diving at night teaches you to focus on what you can see in your light’s beam, controlling your buoyancy by feel, staying with your buddy and paying attention to details you may overlook during the day. You'll learn night dive planning, organisation, procedures, techniques and how to foresee, reduce and handle potential problems. You'll also learn additional diving skills such as how to control your buoyancy, navigate and communicate - at night. It's quite different to doing it in the day light. And since you'll be seeing a lot of new nocturnal marine life / behaviour, you'll also learn about what to look for underwater, specifically on night dives. 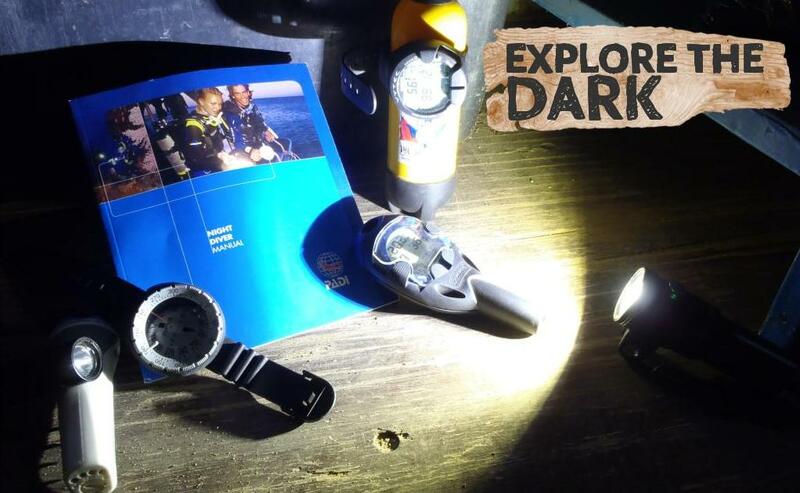 There's a Night Diver manual for you to read and 2 Knowledge Reviews to complete, to ensure you've mastered the theory behind this exciting adventure. Your Dive Bus PADI instructor will be there to take you through all of this and to brief you on the skills and the dives themselves. Dive light handling and communication techniques. Along with your basic scuba equipment, you’ll need a primary dive light and ensure you or your buddy has a backup light, too. You may also want more exposure protection to stay comfortable after dark – even here in Curacao. All the equipment you’ll need (except additional exposure protection) is provided during your PADI Night Diver Specialty course, and there’s plenty of choice in The Dive Bus shop if you’d like to get your own. You can be sure that your Dive Bus instructor will advise which equipment is right for you, not their wallet, as there’s no sales commission here. Already Advanced Open Water certified? Check out the rest of the heaps of PADI Specialty Dive courses to enjoy. Each PADI Specialty Diver certification moves you one step closer to earning the coveted status of PADI Master Scuba Diver: the highest rating for recreational scuba divers. 3 training dives over 2 nights. If you completed your PADI Night Adventure Dive within the last 12 months, you only need to complete 2 dives over 1 night. Swing by The Dive Bus as soon as you get to sunny Curacao to pick up your PADI Night Dive Specialty manual, and start learning! If you can’t wait until you get to Curacao to get started, visit your local PADI dive shop back home to pick it up instead. Everything clear? Do it: book your PADI Deep Diver Specialty course with The Dive Bus now! Love your PADI Night Diver Specialty? Diving becomes a whole lot more interesting when you know what you're looking at.